This Tuesday, April 3rd, Obey Giant will be releasing the newest large format screen print by Shepard Fairey, “Golden Future”! This large format print was inspired by the paintings in Fairey’s latest body of work featured in the Damaged exhibition. The Golden Future Large Format Screen Print by Shepard Fairey measures 33.5” x 47.5” and features 5 colors on cream 100% cotton archival paper with hand-deckled edges. What’s really cool about this particular paper is that it uses salvaged material to create a more eco-friendly product, reusing what would typically be considered waste. Each print comes hand signed and numbered by Fairey, features the Obey publishing chop in lower left corner, and includes a Certificate of Authenticity (COA). 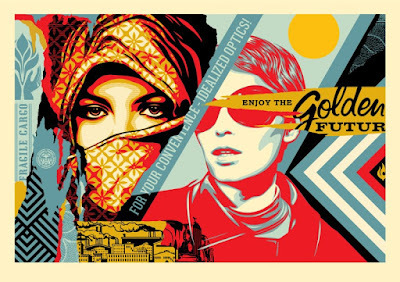 Limited to just 75 pieces, collectors can purchase the large format “Golden Future” starting at 10am PST on April 3rd at the Obey Giant online store for $900.